Cars are designed to last us for a very long time, but one thing is for certain – no car is going to last forever. Anybody who’s driven an old car or has had their vehicle for a very long period of time has probably been in a situation where it simply won’t start. Usually, this is a sure sign that you’re in the market for a new car, but what can you do with the old one? You may not be able to drive it any longer, but here are five things that you can do with your old car. Don’t be fooled into thinking that just because your car is no longer driveable, it’s not going to be of use to anybody. Cars are highly recyclable, and just because your old banger may not be of any use for getting you around anymore, its parts may be in high demand from people who refurbish and repair vehicles. Somewhere, there may be a car just like yours that really needs new doors, wheels, and other components. If your car’s bodywork is in otherwise good condition, don’t let it go to waste just because the engine has given up the ghost. Before you send your car to the scrapyard, you might want to think about selling it for parts instead. Sometimes, the only option that you have is to send your car to the scrapyard. Although it’s sad to see something that’s served you for so long meet this kind of end, be sure to get the most from it by using a scrapping scheme that pays you. Visit Scrap Car Network and enter your car’s registration plate number and your postcode to see how much it is worth. Then you can put the money that you make towards upgrading to a shiny new car. Unless you’ve seen this coming for a while and have been saving up for a shiny new car, chances are you’re not financially ready to replace your old car right away. The good news is that many car dealerships will offer part exchange schemes, even if your old car isn’t in the best condition. Even if it’s not starting you may be able to find a dealer who’s willing to knock some money off the price of a new car in return for your old one; they may be able to use it for parts, particularly if they’re in the business of fixing up written-off cars and selling them on. If you know your way around an engine and have an interest in fixing old cars, then you might want to consider refurbishing your old vehicle instead of getting rid of it. Of course, the amount that you can do will depend on the type and age of your car, plus the amount of damage done to it. And, it’s always worth considering whether the cost will be worth it. Buying and fitting a new engine might seem like an appealing idea, but is it really that wise if you can simply buy yourself a newer car for the same price? Some people like to get creative with their old cars and turn them into something unique and eye-catching. Many business owners have old cars that they use to hold or display advertisements, or you could paint it up in bright colours and make it eye-catching to raise awareness for a cause close to your heart. However, be careful if you’re going to leave your car on the road like this – the last thing that you want is to have it seized if it’s not taxed! Of course, it’s always worth double-checking that your car is repairable. The last thing that you want to do is send it to the scrapyard when a quick repair job would have got it back on the road again. So, before you decide what to do with your car, it’s worth getting a qualified mechanic to take a look at it first. 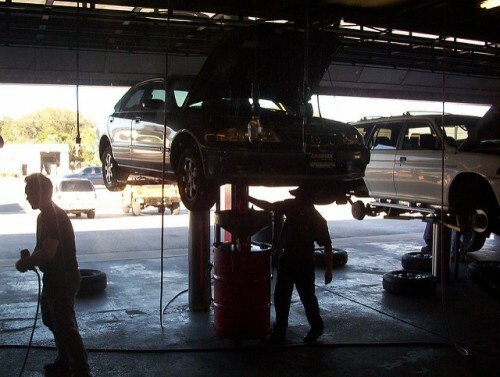 They will be able to tell you exactly what’s gone wrong and whether it’s worth paying out for repairs. Just because your car is old doesn’t mean that it has zero life left in it! In fact, older cars often tend to be the most robust and you might find that getting it started again is a really simple job. What do you do when your old car is finally coming to the end of its days? Don’t just scrap it for nothing in return – there are many ways that you can ensure your old car is still useful to you, even if you can’t drive it on the road anymore.